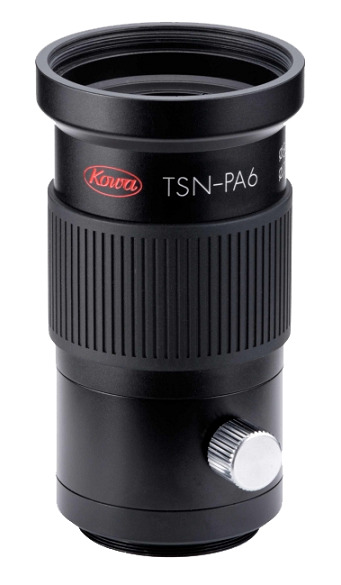 The Kowa TSN-PA6 Digital SLR Camera Adapter allows your TSN-770 or TSN-880 series (77/88mm) spotting scope to be converted into an extreme ultra-telephoto lens, to be used with digital SLR cameras that feature the smaller APS-C or Four Thirds sensors. The 35mm equivalent focal length is approximately 1.5 times the focal length for an APS-C format digital camera and approximately 2 times for a Four Thirds format camera. The TSN-PA6 Digital SLR Camera Adapter features a T-mount lens mount. You will also have to add a camera-specific T-mount adapter that matches your camera's specific lens mount. You will need to take precautions to minimise vibrations, such as using a sturdy tripod, locking up the mirror if possible, as well as using a cable release or remote control to fire the shutter.